Nasa's Mars rover Spirit has discovered structures resembling the spheres its twin buggy, Opportunity, has found on the other side of the Red Planet. 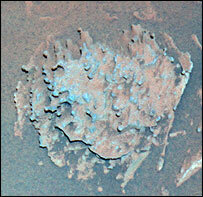 Like the so-called blueberries observed by Opportunity, the nodules Spirit has seen are weathering out of layered rock. And in a paper published in Nature magazine, US scientists have outlined how similar objects form on Earth. This may help researchers flesh out the role liquid water has played in the history of the fourth planet. The term blueberries came about because it was thought the spheres looked like "blueberries in a muffin". The Earth blueberries are found in certain regions of southern Utah and are known to hippies as "Moqui marbles". The spheres, known to geologists as concretions, form underground when minerals precipitate out from groundwater flowing through permeable rock. 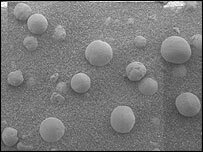 Chemical reactions trigger minerals to precipitate and start to form a layered, spherical ball. In Utah, as in at least one site on Mars, the nodules form from the mineral haematite. "Before Opportunity landed, we thought there might be haematite concretions on Mars. That was based on our study of haematite-rich regions of southern Utah," said Marjorie Chan, professor of geology and geophysics at the University of Utah, US, and lead author of the Nature paper. The nodules found by Spirit at its Gusev Crater landing site are much more variable in size to those at Opportunity's Meridiani Planum landing site. On Earth, too, the diameters of the spheres are more varied than those found at Meridiani, ranging from 0.1cm to 20cm. Spirit has also spotted unusual geological features which scientists have named "Rotten Rocks" due to their resemblance to rotting loaves of bread. The insides of the rocks appear to have been eroded, while their outer rinds remain intact. These outer rinds are reminiscent of those found on rocks at Meridiani Planum's Eagle Crater. On Tuesday, Spirit was roughly 50m (164ft) from the base of its target location of the Columbia Hills. Scientists have identified layered rocks at this location using images from space and hope the rover can uncover more evidence there of the past history of liquid water on Mars. Meanwhile, Opportunity is continuing to make progress at the 130m-wide depression dubbed Endurance Crater that it is exploring on Meridiani Planum. On Tuesday, Opportunity drove 3.9m (about 13 feet) into the crater, then backed up 1.4m (4.6 feet), remaining inside the depression. 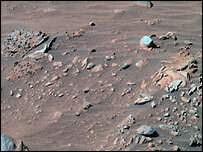 Scientists are being extremely cautious, as Opportunity could slip and get trapped in crater. Engineers have conducted simulations on Earth with a test model of the rover to determine what kind of soil slippage Opportunity will encounter as it descends into the hollow.